But currently, I can not get it to work although I have followed every step. I use a USB stick and I connected the controller with a generic micro USB cable. I got it, it's all resolved! I can't delete my post... ? whenever i move the left analog stick down, or move the right analog stick right, the controller vibrates, and dosn't do what i assigned it to do. Windows find controller as Wireless Controller, but the program not found the controller. I tried press button PS. PS+Share, change a usb-cable, change a usb port. With another programs I get same result. I had a similar problem with DS3 and MotionJoy, I found a solution to the problem, but I can't remember how I fixed it. 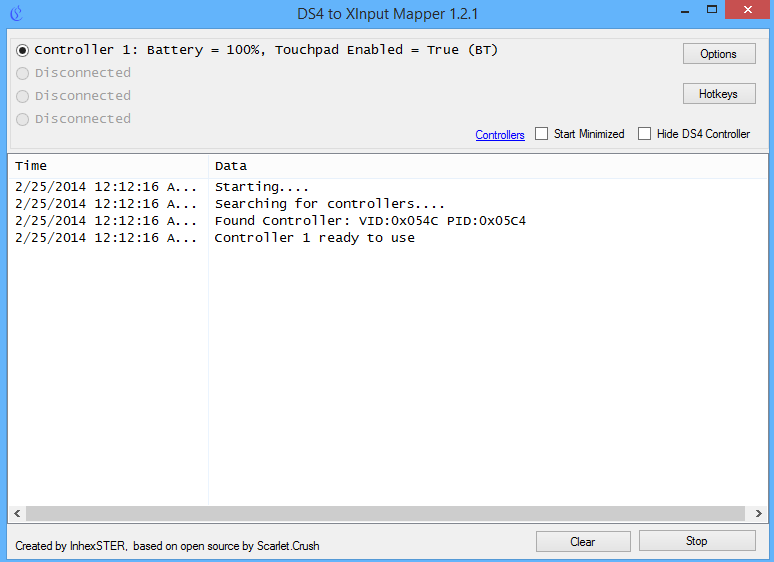 (11-08-2013, 06:25 PM)InhexSTER Wrote: Hello guys, I am new here but I want to share a tool I made for Dualshock 4 controllers. I was inspired by the tool made by Scarlet.Crush for DS3. fox example if i hold the R1 trigger it heeps jumping from no input to full input did i do somthing wrong? could you help me or do you know what the problem is? hey guys, tried everything and every step but it still doesn't work. no ideas on how to fix it. it detects my controller as an audio input, dont know how to change it, any ideas? Anyone tried DS4Windows? Is it good/bad? I´m having problems for the game PREY detect my ps4 remote with ds4, anyone having the same problem?